This office is open all year, but not every day. SPECIAL OFFERS: For 2017: Free Federal 1040EZ when prepared & filed by February 28, 2017. Also, due to Federal "PATH" Act, if your 2016 Tax Refund includes amounts for Earned Income Tax Credit, Additional Child Tax Credit or American Opportunity Education Tax Credit, all of your refund will not be issued by The US Treasury until after February 15, 2017. At H&R Block you can apply for a "Refund Advance" starting January 9 till February 21, of up to $1250 Interest & Fee Free. 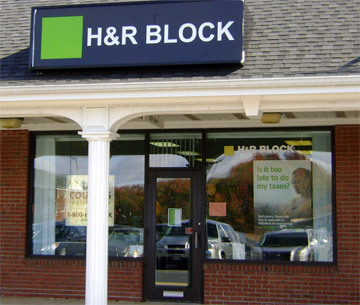 All First time H&R Block clients are encouraged to bring in their previous filed tax returns, with supporting documentation, to allow us to prepare a "Free Second Look". There is a fee, only if YOU want to correct and amend that previous return! MORE ABOUT H & R Block - Income Tax Preparation Services: Clicking on our corporate website, HRBlock.com, then entering your zip code to locate our offices for hours of operation, and to choose appointment dates & time. Call us directly on the above office phone number to make inquiries about our services or to make an appointment. We Prepare Tax Returns for all situations: INDIVIDUALS, SOLE PROPRIETORSHIPS, SMALL BUSINESS, which include RENTALS & INVESTMENT INCOME. We can prepare and/or Amend tax returns for past years. Walk-ins are always WELCOME!